We had the winter’s first snow this past weekend, and there was new puppy excitement all over my house. There would be snowmen and sledding and hot cocoa with marshmallows. As they do every year, the town flocked to the local golf course to enjoy the winter playground. Of course, we weren’t supposed be there. But this kind of snow can’t be squandered. It must be raced on and sledded down. It must be as covered with red cheeks and happy smiles as the hills are with dazzling bright snow. 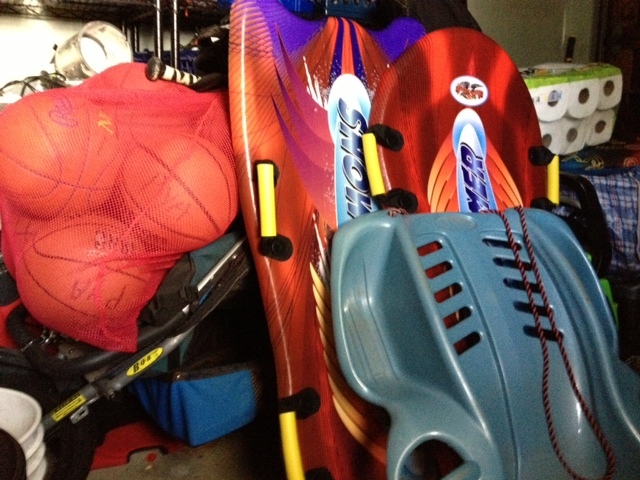 The day before, in anticipation of the coming blizzard, my husband went in search of new sleds. No cheap plastic ones would do. No sir. We went to no less than four different stores before finding the acceptable vehicles for complete sliding satisfaction. I bundled the kids’ energy into snug little suits and sent them off with their dad. I don’t enjoy sledding at the golf course. For one, it’s cold. Second, it’s too crowded and dangerous. I’m wincing with every run. Teenagers take too many risks. Kids are racing back up the hills, where sledders are racing down. Many are without helmets. Children are unsupervised. It’s fast and wild. The near misses make you cover your eyes and exhale with a cold puff of visible relief. And then we all laugh, because we got a thrill, the day is brilliant, and it’s all good. Except this time. What should have been a near miss was a direct hit. One second, a beautiful little girl was laughing, speeding down the hill with her friend. The next second, horrified silence. The unimaginable. The moment where life changes forever. So many adults and kids witnessed, even commented, on the danger of those slopes. But we do as we always do with risks that we take every day – I’ll just type one text while driving, I’ll just leave my kid playing on the lawn for one minute to answer the phone, I’ll just let a few boys jump in the trampoline together – we close our eyes and assume that nothing horrible will happen. How could it, on such a brisk, stunning day? How could it, to such a perfect little girl? It could have been any number of people hurt that day. In fact, there were quite a few injuries. It could have been my kids. It could have been anyone’s. But it was a sweet third grader who I am now praying for with every ounce of hope that fills my soul. My kids are never going sledding again. I know. I know. It’s a slippery slope. But that’s a risk I’m willing to take. At least when it comes to sledding at the golf course. They’re already back in storage. Posted in Crap that makes me eat too much ice cream and tagged blizzard, helmets while sledding, parenting, sledding, sledding accidents, winter sports. Bookmark the permalink. Oh no. That’s heartbreaking. I’ll pray for her too. And my kids aren’t going sledding either. Life is unfair and can be unpredictable. We are all praying for Sydney and her family. Oh, such heartbreak. Praying for good news. we all are. i just realized i posted such a bummer on valentine’s day! I’m so sorry! That’s the problem with sledding; so much fun but so dangerous! Will pray for the little girl. well said. we were sledding that day too and commented that it’s surprising that we all don’t wear helmets. so tragic and frightening and preventable. it’s hard not to want keep your kids away from any potential danger. praying for her too. Very well written and once again I am brought to tears thinking about this little girl whom I do not know. My heart aches for her and family. I haven’t stopped thinking about her since this incident, as I am sure the rest of our community. I am definitely one of those mothers who never made or make my children wear helmets. They all Ice Skate, ride bicycles, sled like the rest of the kids. I have always been a free spirit and taken pride that my children are as well. I let them go and run free… they are only kids once. My perspective has changed- They will in fact wear helmets from now on when they go bicycling, they WILL wear helmets if and when they go sledding again. We were there the day of the accident- in fact Louis continued on to another slope afterwards without knowing how bad it was. My kids sledded the entire day without helmets.. NO MORE!!! My heart aches – It only takes one second to change your life. I know. Sometimes we’re so carefree… but we’ve got to figure out how to be carefully carefree. i just can’t stand what happened. Oh, that is horrible! Horrible! It is such a hard balance between enjoying life and staying safe. If a sledding hill is properly run, it’s pretty safe, but those are a rarity. I pray that things turn out well for that little girl! Oh no! I know firsthand how dangerous sledding is! When I was 7 years old, I was sledding in my backyard, by myself and I hit the clothesline pole and ended up in the hospital for 8 days with internal injuries! It seems like such an innocent, safe sport but that is not always the case. I really feel for that little girl and her family. it’s terrible (and still a wait and see..). Your story is terrible too!! ugh. so much that we take for granted is really so dangerous. thanks.